Arlington, VA, March 25, 2013 – Building on the research and experience that has informed decades of children’s programming, PBS KIDS has launched its first app designed specifically for parents to help them build early math and literacy skills for children 4 and under. The app provides more than a dozen games parents can play with their kids, each themed around a familiar location, including the grocery store, restaurant or home. The app not only provides games, but gives parents advice on adapting these games in real-life settings and the option to receive push notifications with more tips for building skills. PBS Parents Play & Learn for iPhone, iPad and iPod touch is available on the App Store. The app is also available for Android on Amazon, and now on Google Play and on the NOOK Store™. Developed by early childhood experts, PBS’ bilingual (English/Spanish) app helps parents build their children’s math skills – including counting, measurement and estimation – and literacy skills, such as letter identification, rhyming and vocabulary. The app divides activities into three stages: baby, toddler and preschool. Since launching earlier this month, it has been downloaded more than 162,000 times. 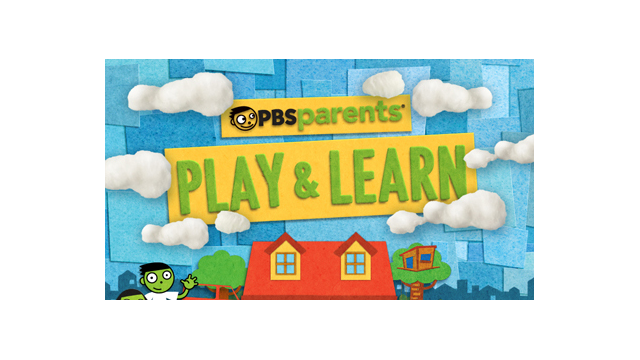 As a free app for mobile devices, PBS Parents Play & Learn offers a resource for families of all income levels. The PBS Parents Play & Learn app is part of the Ready To Learn Initiative, an early learning project of PBS KIDS and the Corporation for Public Broadcasting (CPB), funded by the U.S. Department of Education to support the development of early math and literacy skills in children ages 2-8, especially those from low-income families. In addition to Ready To Learn funds, PBS Parents Play & Learn also received funding from the Campaign for Grade-Level Reading, a collaboration of foundations, national nonprofits, states and communities that aims to help children from low-income families succeed in school and graduate prepared for college, a career and active citizenship. - Key math skills introduced include counting, shape recognition and vocabulary, spatial awareness, measurement, mapping, estimation and more. - Key literacy skills introduced include letter recognition, phoneme recognition, color recognition, print conventions, rhyming, following verbal directions and more. - 13 interactive games for 3- and 4-year-olds themed around a location or activity relevant to a child’s everyday life (e.g. grocery store, restaurant, bath time, in the car, playtime, etc.). - 52 hands-on activities (4 per location) designed to provide parents with easy ways to take advantage of those learning moments that arise every day, whether at home, in a car or bus, or at a destination such as a restaurant, grocery store or library. - Parent notes accompanying each game provide parents with information about the skills their kids will practice while playing the game, parent engagement tips to maximize a child’s learning potential while playing the game and ideas for extending the learning into the real world. - A free-play sticker area where kids can click and drag any of 83 stickers into a landscape to create their own scenes. The sticker area also provides parent-child engagement opportunities. - Completely bilingual, all the text and the voice narration in the app are in both English and Spanish. The app defaults to the language setting of the phone or tablet, but a click of a button allows users to toggle easily between languages at any time. - Push notifications, which parents can opt to receive, provide additional tips three times per week. The PBS Parents Play & Learn App is available for free from the App Store on iPhone, iPad, iPod touch or at www.AppStore.com. The app is also available for Android phones and tablets, including NOOK® HD and NOOK® HD+, Kindle Fire HD 7 and Kindle Fire HD 8.9. For more details, visit pbskids.org/mobile. With engaging content across platforms like PBS Parents Play & Learn, PBS is increasingly serving kids where they live, learn and play – helping to make any time a learning time on mobile devices, on-air, online and beyond. The Campaign for Grade-Level Reading, launched in early 2011, is a collaboration among foundations, national nonprofits, states and communities across the nation to ensure that more children in low-income families succeed in school and graduate prepared for college, a career and active citizenship. To learn more, visit http://www.gradelevelreading.net or follow @readingby3rd on Twitter.